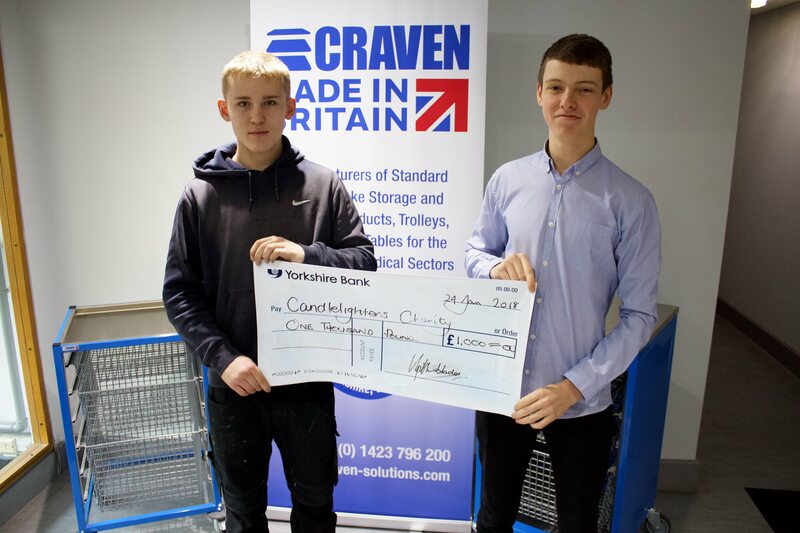 Here at craven, we have been celebrating National Apprenticeship week by taking a closer look into how the apprenticeship scheme has helped our very own apprentices! We currently have two apprentices in our team, James Ward, an apprentice in our business management side of Craven and Charles Nelson, who works in our factory. I’ve been at Craven since July 2017. I work in the office, covering a wide variety of areas. This is mainly sales and accounts, as well as marketing contributions. My days are often completely different, which is great. It means I’m learning as much as possible. My day-to-day work involves purchase ledger, sales analysis and working on one of our quotation systems. I have plenty of support whenever I need it. Craven were really good at helping me transition into working life as this is my first full time job. As such, a lot of tasks have been completely new to me and Craven have been really helpful ensuring that I feel comfortable in completing them. I actually had the opportunity to begin work experience at Craven throughout my last year of Sixth Form. When I started talking with Neil and Angus about my options for the future they offered me a full apprenticeship. Part of my apprenticeship is to go to York College once a fortnight. I study for a business administration diploma which is one of the primary benefits for me doing an apprenticeship. I have the opportunity to work for a well-established, yet not over sized company. So, the opportunities for me to gain experience from lots of people are vast. Although I work in the office, Craven also manufacture their own products. I can then begin to understand the way production affects business. I think this is a really good opportunity not only to learn the processes of a business and building my skill set but to also learn about the workings of a business. For instance managing personnel and seeing the effects different decisions have. There are plenty of people I can learn from at Craven. I would definitely recommend a programme like this because it’s given me an opportunity to further my education and obtain a nationally recognised qualification. I have also been able to learn new, practical skills. Every day I’m working with people who have masses of experience both in business and life generally. I’ve been at Craven since September 2016. I work in production downstairs in the factory. The majority of my time is spent welding. I’m working towards building my skills as much as possible whilst on my apprenticeship. I also have plenty of support. I have experienced colleagues I can talk to as they have all been in a similar position to me. The welders are really helpful making sure they answer my questions and reviewing the work that I do. I found my apprenticeship through York College. They knew I had an interest in the production industry and as I live in the area they found me the opportunity at Craven. There are many benefits to me working with Craven. I have loads of colleagues that are not only really knowledgeable but are really keen to pass on their knowledge. It is a new, busy environment for me which is really beneficial. Obviously I want to really build my welding skills as I really enjoy doing it. But, there’s also the opportunity for me to learn and understand the way the factory works. I would recommend a programme like this to anybody that is interested in practical work. I have really enjoyed developing my skills in the workplace and feel they have improved lots more than they would if I’d just gone to college.